Supporters say ID cards will boost national security. The official cost of the ID card scheme has risen by £400m to £5.31bn, the Home Office says. The figure was released as Tony Blair announced his departure, leading to claims from the opposition that the government was "burying bad news". The Tories also say that the actual rise in costs, when expressed in 2007/08 prices, is £640m. The Home Office say that figure is 'concocted' and the increase was due to staff and anti-fraud expenditure. Amid the row about the actual rise in the cost of the scheme, the Tories and Lib Dems also say that the Home Office broke the law by releasing the updated costings a month later than they should have. Under the Identity Card Act, the government must give an update on the costs of the scheme twice a year. The latest update was due on 9 April. The Home Office said 9 April had fallen during Parliament's Easter holiday and it had released the figures "as soon as we possibly could". The timing with Mr Blair's departure announcement had been coincidental, said a spokeswoman. The £5.31bn cost relates to expected expenditure between 2006 and 2016. Shadow Home Secretary David Davis said: "The public will see through this transparent and pathetic attempt to bury bad news. "It is also no surprise the government has had to revise their cost estimate up by so much. "The public should brace themselves for more increases every time this estimate is updated." Liberal Democrat home affairs spokesman Nick Clegg said: "It is bad enough that the government seeks to bury bad news behind the camouflage of Tony Blair's announcement. "Breaking the law to do so breaks new ground even for Tony Blair's Labour Party." He added: "The costs are now spiralling out of control. On the grounds of expense alone, the government should do us all a favour and abandon this great white elephant before it is too late." A Home Office spokesman said: "The costs report published today shows an actual increase of £40m per annum over ten years - of which 70% will in any case be spent on passports. "As the report sets out, the updated figures take into account extra staff to boost counter-fraud measures as the scheme is implemented." The Home Office added that extra costs were inevitable as British passports were upgraded to meet new international standards and the actual cost to the public of ID cards would not be affected by the latest figures. 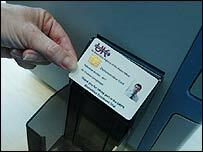 Liberty Director Shami Chakrabarti said: "The soaring costs and declining support for the grand ID card folly are increasingly inescapable. "Surely this dangerous and expensive idea must leave Number 10 with its author?" Phil Booth, of anti-identity card group NO2ID, added: "With each new analysis, the cost of the ID card scheme spirals." ID cards are not due to become compulsory until at least 2010 when all passport applicants will be issued with ID cards.